The Showy Decrease is an amazingly versatile skill. 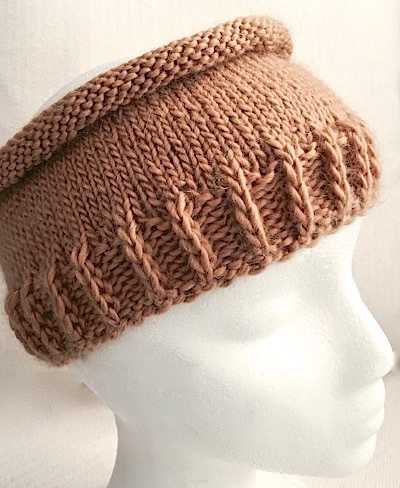 So far we have used it to add detail to the front of Stockinette, shape hat tops, create decorative hat tops, add contrasting color and knit very deep ribs. But wait, there’s more. 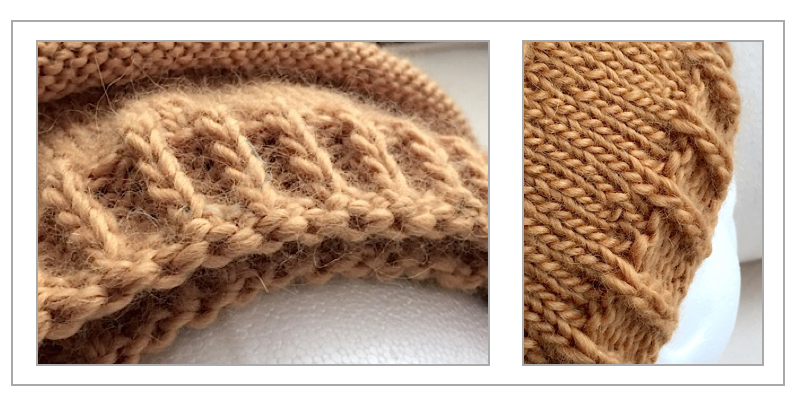 Now we’re going to use the Showy Rib to knit hat brims that are a feature in their own right. And here’s the good news (not that there’s any bad news), the Showy Decrease is even easier when knit in the round. There are a lot of photos in this post, so let’s get started. 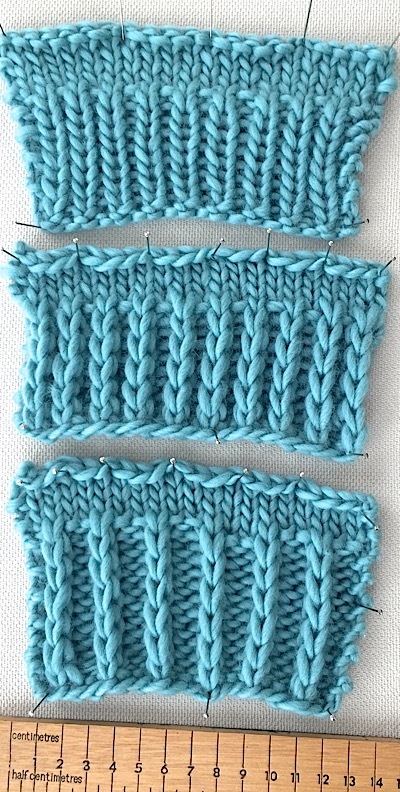 The three swatches above compare a standard 1×1 rib, a 1×1 Showy Rib and the highly dramatic 1×2 Showy Rib used in our free Telluride Scarf pattern. These aqua swatches were knit with a bulky yarn that’s easier to photograph, but the impact is as dramatic in a Sport or DK weight. Check out this brim knit with Cascade Highlands Duo alpaca/merino blend. 1×2 Showy Brim with Alternating Long Tail CO is almost TWICE as deep! Let’s take a closer look at how the Showy Brim options compare to a standard 1×1 rib. The Showy Rib provides you with a very elastic rib so I recommend you start off with either the Resilient Cast On (as shown in the light blue hat up top) or the alternating long-tail cast on used in the gold hat above. The gauge of the 1×1 Showy Brim is just a bit wider. You’ll want to take that into account when determining the cast on for a hat pattern you are modifying. I would, of course, recommend knitting a swatch. 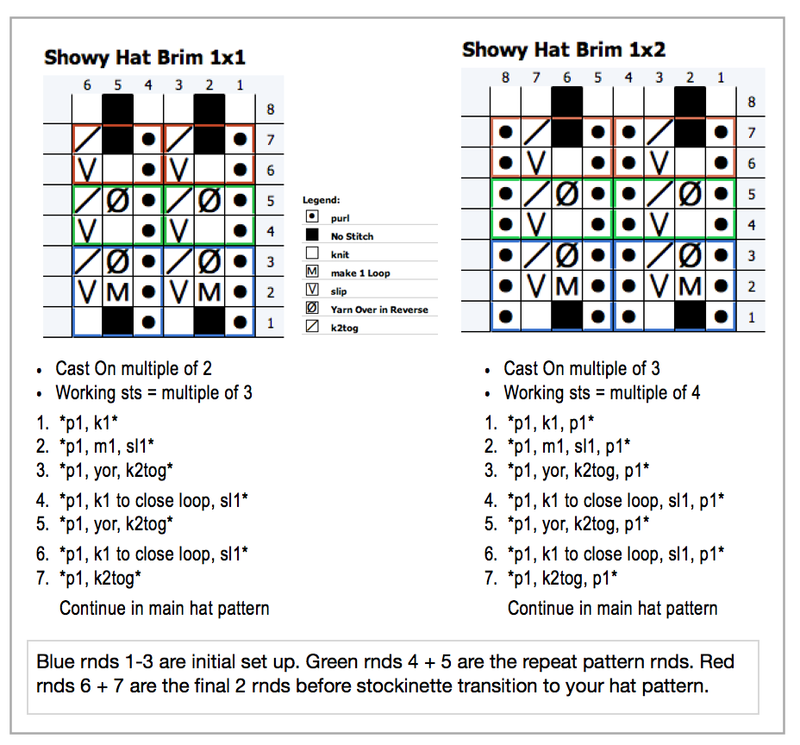 The extra purl stitch in the 1×2 Showy Brim condenses more. Download our free Telluride Canyon Scarf Pattern from Ravelry for help with legend and basic instructions. Read the Vertical Showy Decrease blog for info on the Reverse Yarn Over which is essential for preventing gaps in your rib. Click on the Showy Decrease category for all our Showy Decrease blog posts, many of which include detailed tutorials. Our website Techniques Page has free tutorial downloads for the Resilient Cast On, Alternating Long Tail Cast On and Showy Decrease. I hope after my long absence, I have given you enough to sink your teeth into and I thank those that sent notes wishing me a return to better health. The Highlands Duo brim I showed you above is just that – a brim with no top. I haven’t decided how to finish this ‘swatch’ but I’ll be sure to let you know when I do. Like interesting hat brims? Check out this new post, Ban Boring Hat Brims, with a Showy Broken Rib. It uses our newly announced Woven Cast On which adds interest and stretch. On the Highland Duo brim, bind off where you are, if that’s not already done. Pick up some rows below the current end point, so the stockinette roll remains at the top of the brim. Knit the crown from there. I love your flat I cord and some of the other innovations! But I have to say that personally I like the looks of the standard rib better, because it hides the purl stitch – which is ugly. looking to me. I even rework cable patterns when I can to reduce the number of purl stitches next to the cables. If you don’t like to see the purl stitch, then try the 1×1 Showy Rib. The knit stitch sits so high up the purls are completely invisible! 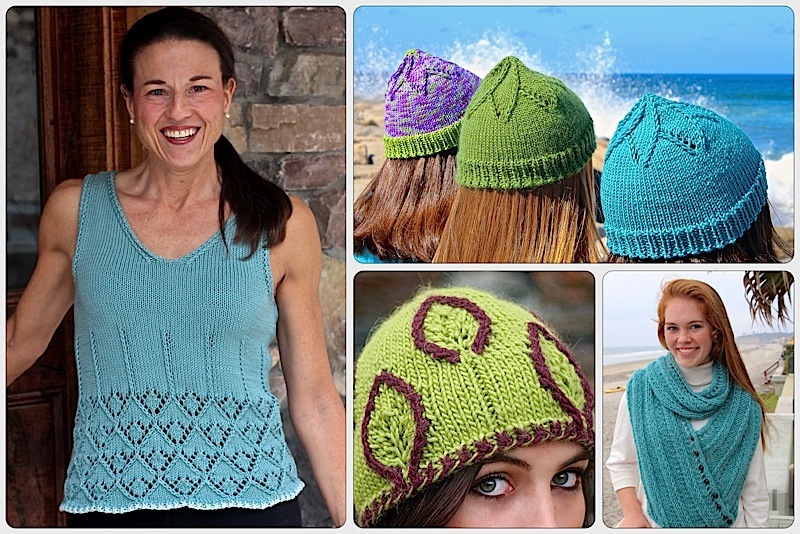 This entry was posted on June 25, 2015 by Laura Cunitz in Hats, Nuances, Showy Decrease, Showy Rib and tagged hat brims, knit hats, Knit Ribs, Nuances.